Foam Filled tire, view from the inside. Constantly having flat tires? Is it causing you unacceptable Down times? You can count on us, Ewald - a company you can trust! We offer Foam Filling on any of your air filled tires. Foam filling can eliminate any unbearable down times caused by a flat tire. Foam Filling is very durable, and will elminate any flats! 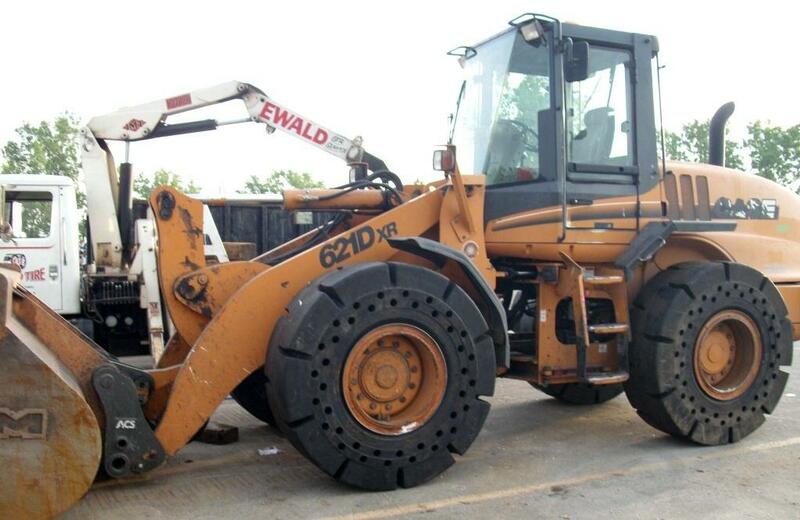 Ewald Industrial Tire & Wheel services the complete Tri-state area. We service Indiana, Michigan, and Ohio area. * We can press all sized rims, we have the biggest "in house" tire press in the Tri-state area. * Dismount old tires, and mount on new replacements. * Tread Lug, Groove, and Tire Siping. * Weld, or Lug Wheel / Rim. * Scrap old removed Tires. Locally owned, small business with over 70 years of combined experience in the Industrial Tire & Wheel Field.